Galloway, N.J. -The $220 million Atlantic City Gateway Project “demonstrates that we’ve turned the corner” in efforts to revitalize the city, said Gov. Chris Christie today, joining state Senate President Stephen Sweeney, Atlantic City Development Corp. (AC Devco) Chairman Jon Hanson, South Jersey Industries President and CEO Michael Renna and Stockton President Harvey Kesselman to break ground for the project, which includes Stockton’s new residential campus. “This city is an extraordinary asset to the region and state,” Christie said. He noted that efforts by the state, city, county, university and private developers are all contributing to its renaissance, after an economic downturn that saw five casinos close. The governor thanked Sweeney, Hanson, state Sen. Jim Whelan, and many others who had roles in getting the city’s finances in order and creating legislation and funding for the public-private partnership with AC Devco, South Jersey Industries and Stockton. 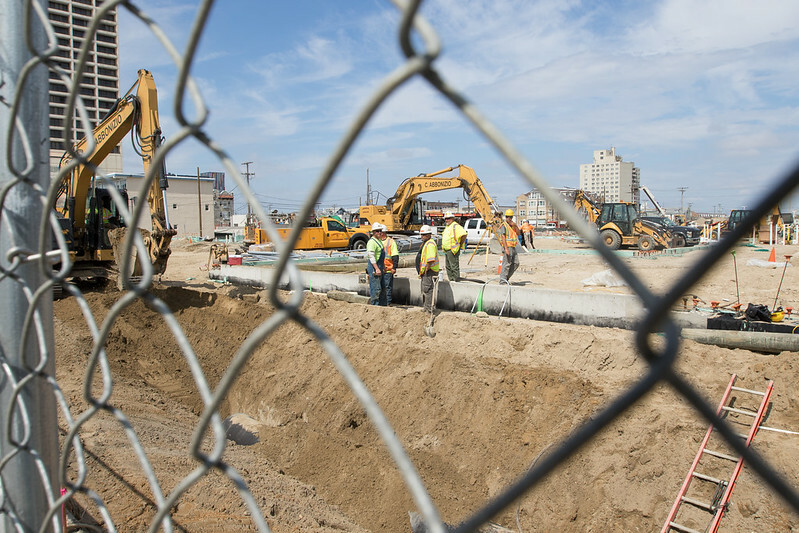 Stockton held its first classes in the Mayflower Hotel on the Boardwalk in Atlantic City in 1971, and has grown from 1,000 students to nearly 9,000, Kesselman said, adding that another 1,000 or more will be attending classes at the new Atlantic City campus in fall 2018. “Today, we take the first steps of a new journey: one that recommits our intellectual promise to the residents of Atlantic City – and all of South Jersey – by establishing a new branch campus on the world’s most famous boardwalk. A branch campus that will include a state-of-the-art academic building, 533 student residences overlooking the beach, shops, food and parking galore,” he continued. “Working together, we will raise more than steel, brick and mortar. We will raise hopes and nurture opportunities,” Kesselman said. “We will ensure that a Stockton degree becomes more valuable each and every day – for our students, for the residents of this extraordinary city. And most important, we will stay true to our values and academic mission: to provide a high-quality, affordable education to anyone… anyone who aspires to plant themselves and grow. Christie had noted that hundreds of college students also “will bring a lot of energy” to the Chelsea neighborhood. Members of the board of trustees and the university foundation attended along with many government officials and business leaders, including Chris Paladino of AC Devco. Stockton has been designated by the state as an anchor institution in Atlantic City. Anchor institutions bring economic impact including fixed assets that are not likely to be relocated; employment potential - jobs generator; ability to attract businesses and highly skilled individuals; purchasing power; and they become central to the city’s culture, learning and innovation. Examples in other cities include Rutgers in New Brunswick, also developed by Devco. The $178.28 million Atlantic City campus will include a 56,000-square-foot academic building with three floors, 14 classrooms and computer labs; 17 faculty offices/work stations; a 3,000-square-foot event room, a café area including outdoor seating, and administrative offices. It will face Albany and Trenton avenues. The residential complex will offer apartment-style living to 533 students in over 200,000 square feet. The residential building will include 15,000 square feet of retail space along the Boardwalk and on Atlantic Avenue, meeting spaces, offices, mailroom, two 50-seat flexible classrooms, a fitness center, and two outdoor courtyards. The Gateway Project also includes a six-story office tower for South Jersey Gas, over 5,000 square feet of retail space and a parking garage with 879 spaces, for a total cost, including the campus, of $220 million. Stockton has received strong financial and other support from the state, county and city and its other partners. The university’s portion of the project cost is $18 million. Parking will be available as well as regular shuttle service between the main campus in Galloway and the Atlantic City location. Stockton's academic efforts in Atlantic City will be led by Business Studies, Hospitality and Tourism, Social Work and Organizational Leadership. The university will also be offering a new, interdisciplinary undergraduate major in Community Leadership and Civic Engagement. Stockton’s other facilities in the city include the Carnegie Center, Dante Hall Theater and the Noyes Arts Garage of Stockton University. Stockton’s Commencement will be held at Atlantic City Boardwalk Hall on May 12, 2017 at noon. For more information about Stockton University’s plans for the Atlantic City campus, visit stockton.edu/gateway.